NASA Landed A Spacecraft On Mars To Explore The Planet's Interior After "7 Minutes Of Terror"
The suitcase-sized spacecraft traveled more than 300 million miles at speeds of 6,200 mph before touching down for its billion-dollar mission. NASA on Monday successfully landed a spacecraft on Mars to explore the red planet's interior after a six-month, 300 million–mile journey capped by a final "seven minutes of terror" to the Martian surface. Only about 40% of all missions to Mars are successful, according to NASA, and the United States is the only country whose spacecrafts have survived a landing on the planet. The tricky landing Monday involved slowing the InSight spacecraft to 5 mph before it plopped down on the surface of Mars, assisted by a parachute and rockets. The most dangerous part of the journey, the transition from rocketing into the Martian atmosphere to slowly landing on its surface, is referred to as "the seven minutes of terror" by NASA scientists. InSight's perfect landing marked the eighth time NASA has successfully landed a spacecraft on Mars. The InSight lander's billion-dollar mission is to probe the interior of Mars and "take the planet's vital signs, its pulse and its temperature," according to NASA's landing website. It is the first mission to Mars dedicated to studying the planet's interior. The findings sent back to Earth by the spacecraft will help scientists understand more about how rocky planets — which in our solar system include Mercury, Venus, Earth, and Mars — are formed and evolve. Called InSight for short, the Interior Exploration Using Seismic Investigations, Geodesy and Heat Transport mission will include three research techniques as the spacecraft gathers information on the planet's surface. 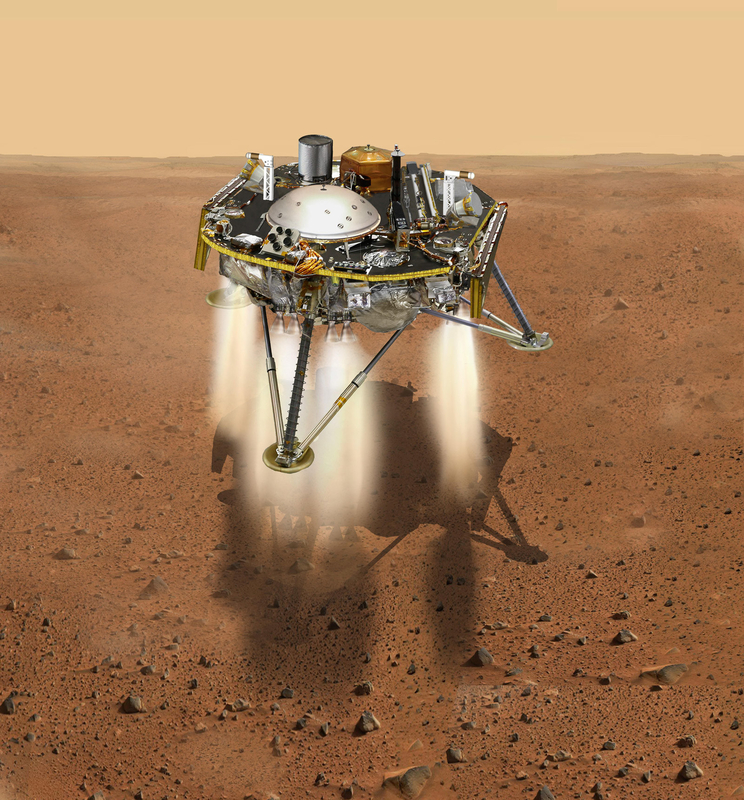 The InSight lander will be the first spacecraft to conduct a deep probe underneath the Martian surface — up to 16 feet, which is 15 times deeper than previous probes. The craft is also the first to use a robotic arm to place instruments on another planet's surface, among them a seismometer to track quakes that might occur on Mars. Soon after landing, InSight was able to send back this super-clear image of Mars. 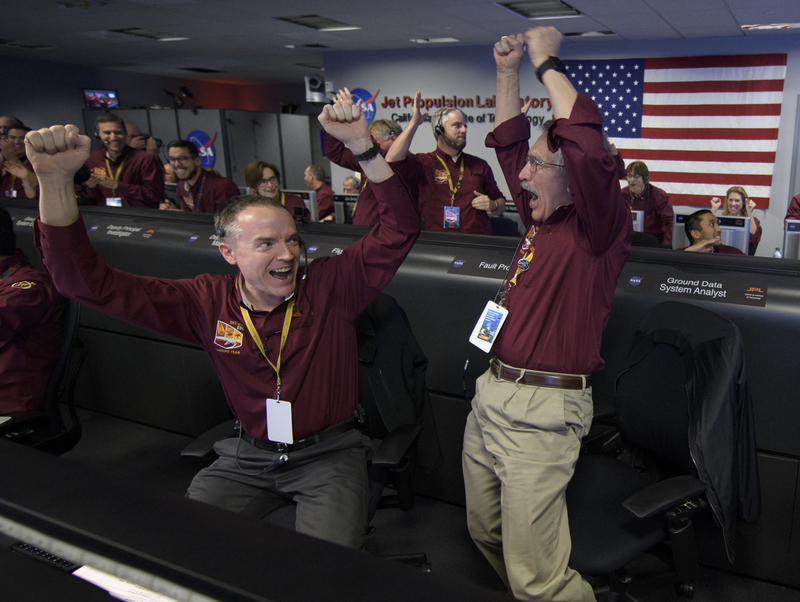 The scientists and engineers watching from mission control at NASA's Jet Propulsion Laboratory in Pasadena, California, were understandably ecstatic when InSight touched down. Also, Bill Nye was there, and he seemed pretty happy too!